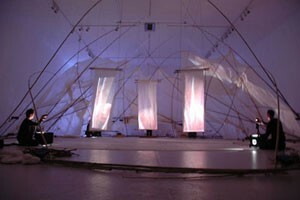 Fragile paper sculpture animated by dancers, a lyrical voice, a sonic landscape, live music, light and shadow play. 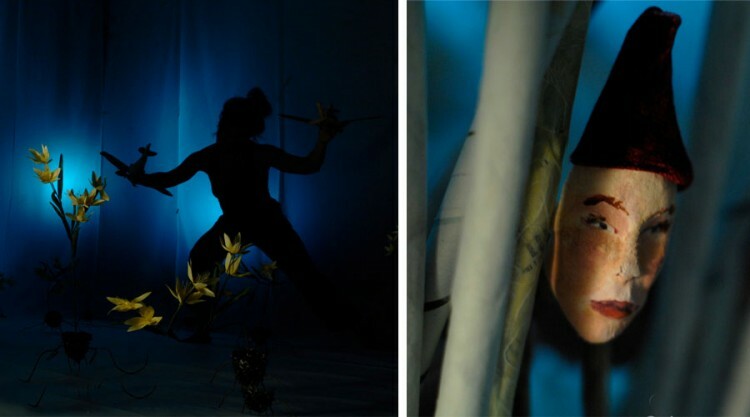 Gregor the Tormented Meadow Dweller, Guna of the Birch Trees, Ivars the Butterfly Catcher, live in a shifting, projected environment of blue and black birds. “Sea of Birds” is an outgrowth of Mundheim’s commissioned work in interdisciplinary biographic portraiture. Her story is about the power and pleasure of the storyteller. It is about the lessons we extract from encounter and departure. This story parallels a child’s memory of Eastern Europe and war with fantasy characters from an American child’s imagination. Originally commissioned by Philadelphia Live Arts Festival, 2008. Funded in part by the Philadelphia Theatre Initiative of the Pew Center for Arts and Culture and the Berwind Foundation. "Mundheim has a remarkable eye and the rare ability to catch her audience by surprise and set us back on our heels. In a profession filled with almost-theres and not-quites, she is the genuine deal, the real thing -- an artist who helps the rest of us see more than we have before." This trailer gives a sense of the environment, choreography, and objects, but not the story. Please watch/listen to the Guna Interview and Narrative Excerpt to have a sense of story. Interview with Sebastienne Mundheim about Sea of Birds – VIDEO from Scrapple TV/Woodshop Films. - Traditional or non-traditional spaces. - No backstage is required. “Sea of Birds,” has many outreach possibilities. Content connections can be drawn to history, social studies, visual and performing arts, as well as education. Workshops are always designed in conjunction with the presenting organizations, and are taught by Sebastienne Mundheim or cast members. Workshops can range from one-hour sessions to semester-long programs. Co-Choreography: Sebastienne Mundheim and Ensemble. Previous performers/creative contributors: Karin Bookbinder, Travis Mesman, Danielle Paloumpis, and Marcelo Rueda. Fabrication/Installation Support: Andy Brehm, Leigh Mumford, Kim Traube, Leslie Rogers, Sarah O’donell, Amanda Elizabeth Olsen, Jamie Labov, Martin Lautz, Doug Magners, Adrienne Cali, Jason Burnham, Stephen Shuster, Ingrid Boucher, Vito Arste, Stan Heleva, Travis Mesman, Terry Mutchler, Ian Smith, and Tom West. Special Thanks: David Orphanides, John Fries, Tom Miles, Andrew Warner, The Crane Arts Center, Nick Kripal, Richard Hricko, Cole Perera, Adrienne Cali, Doug Magners, Andy Brehm, Sarah Odonell, Jason Burnham, Brian Driska, Jason Krapf, Mat Davis, Nick Stuccio, Live Arts Festival, Sarah Labov, Mara Zepeda, Andrew Zitcer, Anna Drodzowski, Doris and Wayne Guymon, Carol Ann Graham, Scott Johnston, Stephen Shuster, Judith Jerome, Sara Coffey, Morgan Jenness, Fran Kumin, and Guna Mundheim. Support has included: Quest for Arts, The Baltimore Theatre Project, Pennsylvania Performing Artists on Tour (PennPAT), New England Foundation for the Arts’ Expeditions Program, made possible with funding from the National Endowment for the Arts and the six New England state arts agencies, the Alice Baber Trust, Vermont Performance Labs, Marlboro College, MassMOCA, Stonington Opera House, Keene State University, Philadelphia Theatre Initiative, a program of the Philadelphia Center for Arts and Heritage, funded by The Pew Charitable Trusts and administered by The University of the Arts, as well as the Philadelphia Live Arts Festival. Additional support for Sea of Birds comes from Sigi Berwind and Gerry Lenfest. Photos by JJ Tizou and Sebastienne Mundheim. Video by Natural Light Films. This story is about my mother’s experience fleeing Latvia during the Russian invasion and German occupation of World War II. But it is less about retelling history, the story, and more about exploring the inheritance of a sensibility. My mother never described her experience as a tragedy, though it is filled with loss. Life is always about loss, this the human condition. Its not worth drawing attention to exactly. I didn’t learn about tragedy at all, instead what I learned was to notice details, to be an observer, to have things to hold onto in my memory and imagination rather than the physical world. What comes out of her experience is the beauty of observing and describing. There is another element of what is collectively, silently observed and remembered that is very powerful. The text is sparse because it is not central. I think what is most important is the sense that even a terrible story can be sung like a lullaby, that even though we make a piece about life’s ephemera we do it with great care and commitment – like the mandala. It is the commitment to building the set that will be taken away and being precise in movements that are absurd in some ways. This commitment to a way of seeing and the quiet collection of experience, this is the soul of the work for me. I am continuing to rework this performance. I would like to try it as an installation, a solo, and a much larger work. All are possible.